A big welcome to those of you who are new readers after watching me on the King 5 11pm show tonight with Jesse Jones! I had the privilege to share about ways to save money on back-to-school shopping. (If you missed the segment , you can access the video here!). 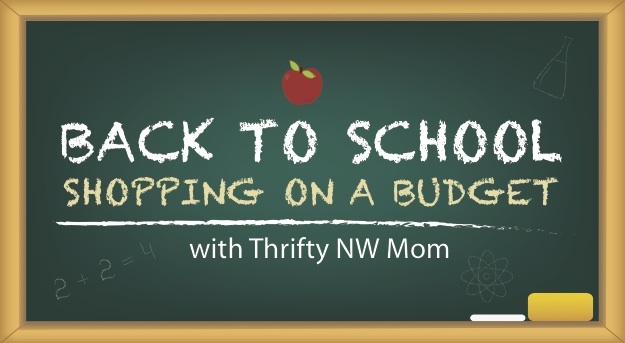 Here at Thrifty NW Mom, my blogging partner Sia & I provide ways that you can trim your budget & save money for your family in all areas of your life. You’ll find everything from ways to save at the grocery stores with coupons to frugal activities to do around the Northwest with your families. We do our best to provide a comprehensive resource of a variety of strategies for saving money in the Northwest. Right now, we are featuring a series about Back to School Shopping on a Budget , where we’re giving you our best tips on ways to save on school supplies, clothing, and more. We are going into the stores to show you how to maximize your savings by using simple shopping strategies & utilizing coupons & matching with store sales to find great deals. We also have partnered with a number of stores with great back to school sales to bring you some fun giveaways to help you on your quest to save money for your family while you get ready for your kids to head back to school. All of the tips I shared tonight are a combination of money-saving strategies you can use to save money in all areas of your budget. One of the biggest areas of your budget is most likely your grocery bill. We will be starting coupon classes in September called Savings Nation classes where we will teach you how to use these same strategies in the grocery stores to save at least 50% off your bill. We will be holding these coupon classes all around Puget Sound to teach you how to take control of your spending & learn how to save money on your grocery bill, learn the tricks for saving at the drugstores & then later how to spend less when shopping for the holidays. Find out more about our Savings Nation classes & make sure to fill out our form to let us know where you live so we can let you know if we hold a class in your area!